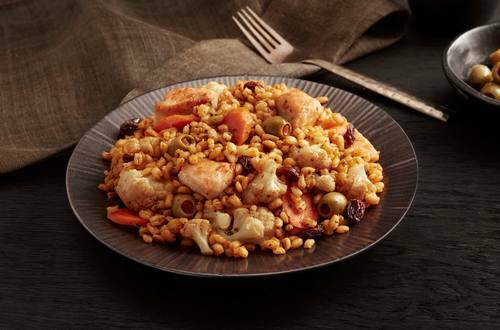 This Moroccan Chicken & Olives with Barley recipeis absolutely delicious. Try it today! 2 ADD water, carrots and contents of Knorr® One Skillet Meals® Moroccan Chicken with Barley to the skillet and bring to a boil. Cover, turn down the heat to medium-low and simmer 13 minutes. 4 STIR in your olives and raisins. Remove from heat and let stand covered 2 minutes. Now it's delicious, dig in!